Why not pamper your furkid with this unique and classy collar? 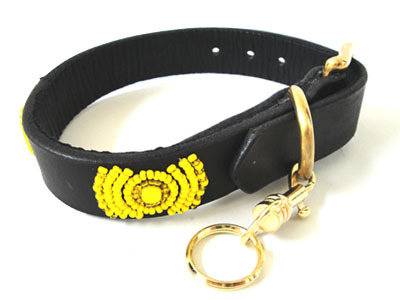 Our Beaded Leather Pet Collars are hand-made in Kenya using genuine leather. 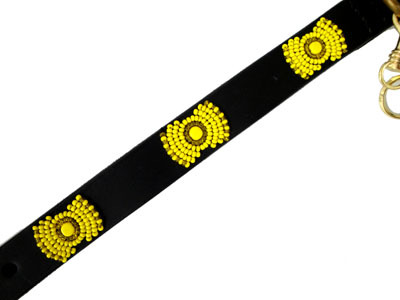 The beads are hand sewn in leather and buckles are hand-cast from solid brass. This beautiful collar gives your furkid a touch of elegance and an air of class. No two collars are exactly alike as we leave the design work to the artisan. 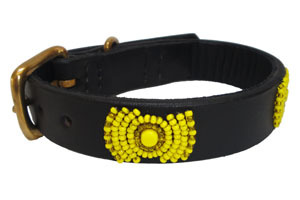 Your purchase of this collar will also go towards helping the Maasai Tribe. The beading is done by Maasai "mamas" working in their home area. By meeting with their coordinator weekly to receive materials, the artisans can earn a living while maintaining their rural and more traditional lifestyle. So when you are amongst your friends, this collar will be a conversation piece. Tell your friends about how the collar is made and how your purchase helped preserve the culture of a unique tribe. You may also like to get a few collars for your friends' furkids to pass on the story! The Maasai are known for their intricate jewelry. Although there are variations in the meaning of the color of the beads, some general meanings for a few colors are: white, peace; blue, water; red, warrior/blood/bravery. These beautiful, unique and high quality pet collars are individually handmade. It takes an average of 1 day to make 1 collar. No two collars are exactly alike as we leave the design work to the artisan, which really makes each collar unique. In addition to being beautiful, they are also durable. Beads are hand sewn in leather, then an overlay of leather is glued and stitched on the back. Buckles are solid, hand-cast brass. Leather is dark brown in color and very thick, approximately 5mm thick. For purchasing collars, we ask that you measure your pets neck and order based on the exact measurement. 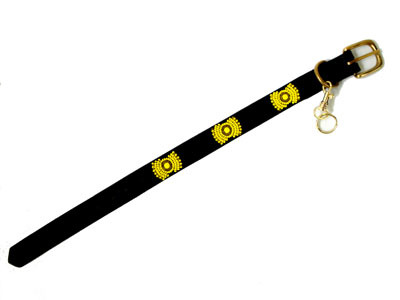 We try hard to fit your pet using the middle hole on the collar as the beading shows up best when it is centered. Our lengths reflect the measurement from the end of the leather at the buckle to the center hole. If the size you want is out of stock, do put yourself on our waiting list and we will inform you once the stock arrives. The stock may take up to a month to arrive as every collar is carefully handmade to ensure your satisfaction. Click here to send in waiting list. These Lurcher Style Collars shown below are 2" Wide. They taper to 1" Wide at both ends.